Fringecup, Tellima grandiflora (Pursh) Dougl. ex Lindl. No particular propagation method recommended in literature. Seed would yield greater numbers of individuals with lower impact. Divisions most likely could be installed same season or potted for more mature plants the next season. Fresh collected divisions could be installed immediately especially in late fall/winter. No references were made in the literature to direct seeding. Germinants ready to plant after first year as 4 inch pots. Based on habitat preference, If installation site is not consistently moist consistent watering during summer and other dry periods crucial. Weekly watering if not daily during especially dry periods. Not noted in literature. Like most perennials that grow vegetatively they most likely persist clonally for long but unknown periods of time. Fringecup has been noted to be a fast grower in suitable conditions. 2) Hitchcock, C. Leo and Cronquist, Arthur. Flora of the Pacific Northwest. 1998. University of Washington Press, Seattle and London. 3) Native Plants Journal and Network. 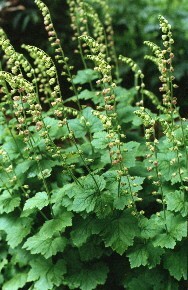 http://www.nativeplantsnetwork.org . 4) Pojar, Jim and McKinnon, Andy, eds. Plants of the Pacific Northwest Coast: Washington, Oregon, British Columbia and Alaska. 1994. Lone Pine Press, British Columbia.